This is a letter to Martha Lane Fox, the entrepreneur and feminist who sits on the board of Twitter. We write to her in the wake of mass deletions from Twitter of gender critical feminists who in many cases have had their IP addresses and phone numbers blocked so that they cannot re-join Twitter. Transactivists have recently stepped up a concerted campaign to get feminists banned from every platform where they can speak out against the dangerous dogma of trans ideology and stand up for women’s rights. 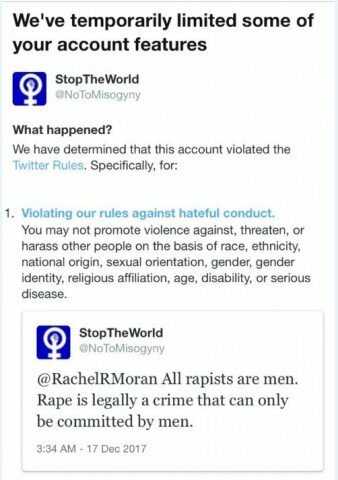 Women are being told they have violated Twitter rules against hateful conduct by simply stating biological and legal facts. Women must not be shamed or silenced for speaking the reality. CLICK HERE for some more examples of what women have been banned for, compiled by Hands Across the Aisle. Women are being silenced. Women like us. We are are mothers, doctors, lawyers, teachers, engineers, members of the armed forces, unemployed, disabled, lesbians, married, single, wealthy, poor, Scottish, English, Welsh and Irish. We are liberal minded women, committed to women’s rights, and social justice. We have fought for reproductive rights, gay rights, spent our lifetimes speaking up for women and against male violence and working to change the systems and structures that oppress us. And now, we are being silenced. By whom, you might ask? Well, by you, for a start. Women use Twitter to speak out about things that matter to them. In recent weeks, for example, we’ve seen women unite in speaking up for women in Ireland using the #HomeToVote and #repealthe8th tags. It has been wonderful to see. Feminists also use Twitter to speak about another issue that threatens to erode not only our hard won rights, spaces and services, but the very definition of who we are. Transactivism. This misogynistic, aggressive, violent movement, that has been embraced by the hard Left as the latest civil rights cause, has seen males colonise womanhood and hijack feminism for its own purposes. Online, women are threatened with violence for saying things that should not be controversial, but have become so. For saying that males cannot become females. For saying that women do not have penises. For saying that women’s spaces such as refuges should be safe havens for women only. Offline we are silenced by politicians, who dismiss our concerns as hysteria, and who refuse to listen. By journalists, who twist our words and reframe them as hate speech and bigotry. By transactivists, who bully venues who try to host our meetings into cancelling, and who turn up at our meetings with masks and dogs, block us from entering us and assault us. 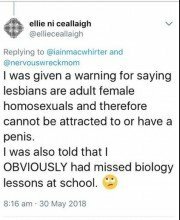 Not only that, women are being told that to talk about their biology is transphobic. That we must refer to ourselves as menstruators, uterus havers, pregnant people. And if we do not comply , we will be punched, that we deserve to be punched. That we are terfs, who should die in a fire, choke on a ladydick, be beaten and abused. Go to www.terfisaslur.com if you do not believe me. This is a concerted attack on women’s free speech. The words we use to describe ourselves, our bodies, our biology and our experiences as women are becoming unsayable. And the worst thing? 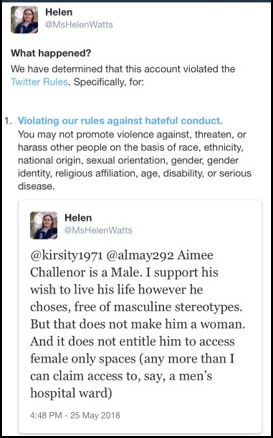 The platform on whose board you sit not only allows these threats and abuse to go on, but women who point out basic, incontrovertible biological facts are being banned from Twitter for speaking the truth. For saying that men are not women. For refusing to lie. Women have been silenced since the beginning of time when we try to stand up for their rights. Today we ask you, a feminist and woman who cares about women’s rights, to use your influence to stop this. Stop allowing bullying men to police our language, threaten us and abuse us. Stop silencing women for speaking the truth. Future generations will surely judge those who were complicit in this silencing of women who spoke only the truth, and who spoke up for their rights. We ask you today to use your voice to speak out against this new wave of misogyny and to stand up for women when we are being deprived of a platform from which to speak the truth. ← Trans rights do not exist in isolation: A fair society balances the rights of all and acknowledges difference. I’d like to add my name to the list, Sarah Cummings. Biology is not hate speech. Would it be possible to start a list of general supporters of the letter? You should get thousands of signatures.